This is one of those wonderful pasta dishes that can be thrown together in a pinch from a handful of ingredients that one tends to have on hand. The simple mixture of brown butter, fresh sage and nutmeg creates a marvelously aromatic meal. So satisfying that I tend to overindulge, resulting in my sinking into one of those warm and fuzzy starch induced comas. Oh yes, I want to go to there. Prepare the pasta according to package directions. Cut the chicken into bite sized pieces and place the butter in a skillet over medium high heat and cook until bubbly. Add the chicken and saute till butter darkens and the chicken has cooked through. Take a little more than half of the sage (reserve the smallest of the leaves to garnish with later) and slice them into thin strips and add to the chicken and butter. Sprinkle with the nutmeg and saute briefly until dish becomes aromatic. 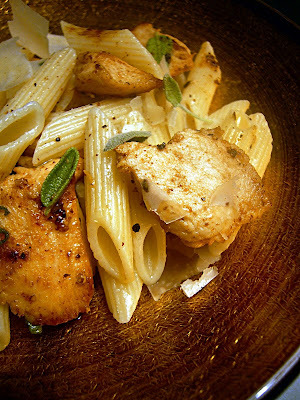 Place the cooked and drained pasta into a bowl and add the Chicken, Sage and Brown butter mixture. Sprinkle with a generous amount of fresh ground pepper and salt (to taste) and toss well. Serve the pasta topped with fresh parmesan shavings and a few of the remaining sage leaves. THIS was a great dish! For being an amateur cook it was very simple to make and the directions were perfect. Miss H is begging me to make more soon! I just made this for dinner, and it was fantastic! Thanks for the delicious recipe! I enjoyed this recipe so much! Wondering if you have any more chicken recipes to share with us?